My name is Howell Upchurch and I would like you to see some photos of a working Civil War era ironclad I recently completed. It's a 25 ft. replica of a Richmond class ironclad. It carries a crew of two, burns coal in the firebox and has 6 working blackpowder cannons. It stays on a trailer and therefore is mobile. 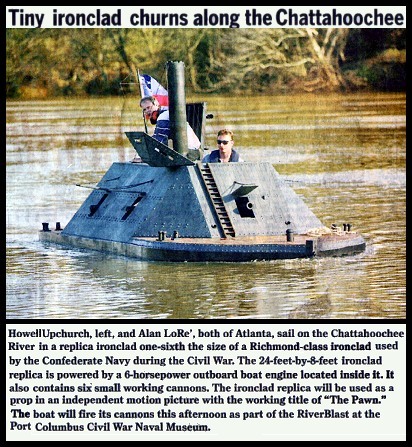 Recently (3/8/03) I performed 7 live shows in Columbus, Ga. (on the river) at the Civil War Naval museum. It was a hit with not only the men but women and children as well. They wanted to sit on the deck and have their picture taken. I built it to promote a project I'm working on (see my project on the web at: www.powdermonkeyLLC.com ) I'm always looking for opportunities to show her off! Located in Atlanta, Ga. More photos available. 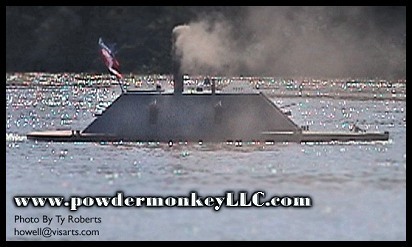 www.powdermonkeyllc.com/gunboat.shtml and follow the link at the bottom of the page labeled "Click Here To See Some Great Pictures Of The Boat In Action". This movie clip shows how the original ironclad might have looked in action. If you don't have a movie player, you can download Quicktime for free from the Apple site. Believe it or not, they have a version that will run on windows.